Pop-ups are an interesting phenomenon online. Everything about them seems to go against all the best practice ideas you would take from UX design. Pop-ups often show users something they’re not looking for and stop them from interacting with the content they are looking for. 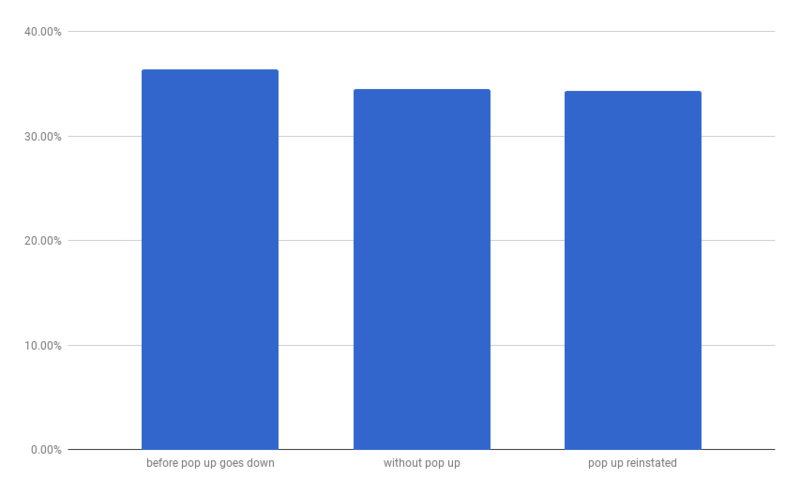 On top of that pop-up ads are widely disliked by users with this study finding them to be the least liked form of advertising. Three years ago the inventor of pop-ups apologised for creating them in the first place. 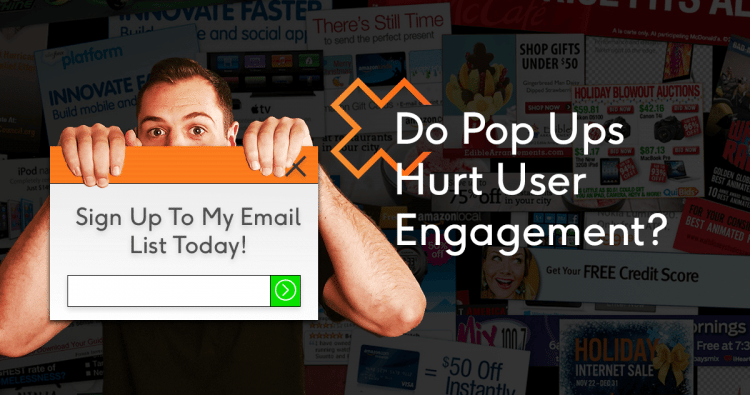 Pop-ups are still extremely effective. Of course you can’t sell just anything in a pop-up, but if the content of your pop-up is relevant to your website’s content, research show that pop-ups generally have excellent engagement statistics. But some web designers still baulk at the idea of pop-ups, perhaps citing while it might get more sign ups it will inevitably affect user metrics. As a data driven SEO agency in Melbourne, we don’t make decisions based on gut-feel, we try and listen to data. And we have some stats from one of our client’s website that seems to suggest the opposite. This website is in the Personal Training and Fitness Niche. The website is currently averaging 600-800 sessions per week. The above website was running a mailing list pop up continually since 2014, then around Christmas time last year it was taken down due to a few details around how the business was being managed. The pop up stayed down until late in February and then the exact same pop-up was reinstated. 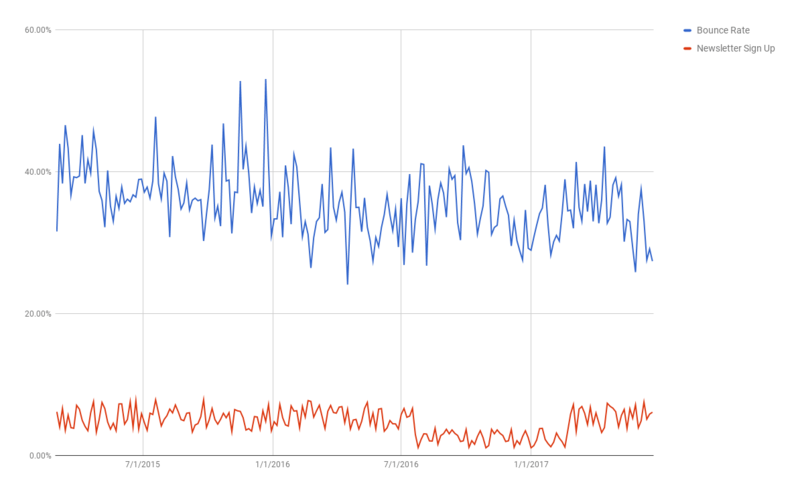 Which shows that having the pop-up in effect had little to no effect on the bounce rate for the website (in fact it seems to actually have a positive effect from this data alone although I’ll get to that in a moment). However the mailing list sign up rate is more than doubled by the pop-up. From this data alone it seems that the pop-up delivers sign ups with no appreciable effect downside in user experience. When mapped against Exit Rate we see a similar non-effect. 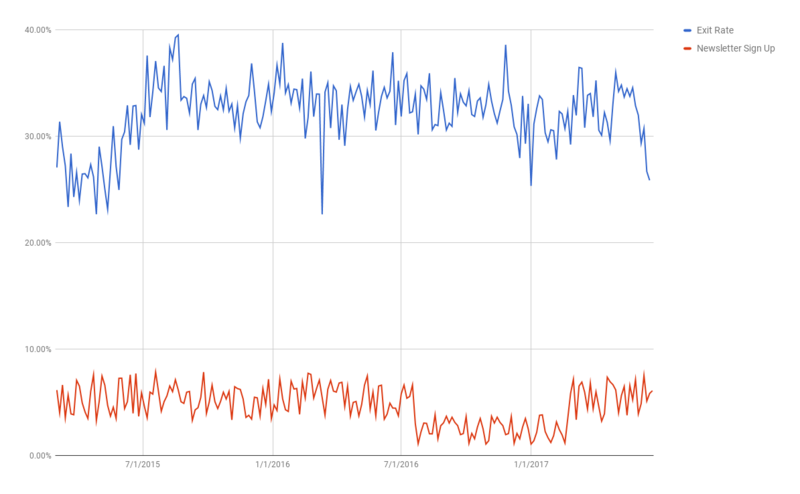 And when we look at time on page, we again see time on website go down after the pop up stops showing (the opposite of what you might expect). 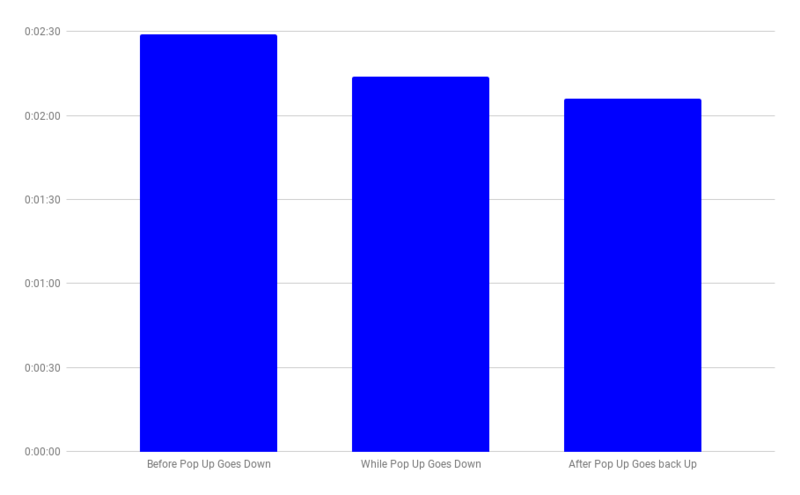 However one thing is clear from the data, the pop up had no immediate impact on how users behaved onsite. 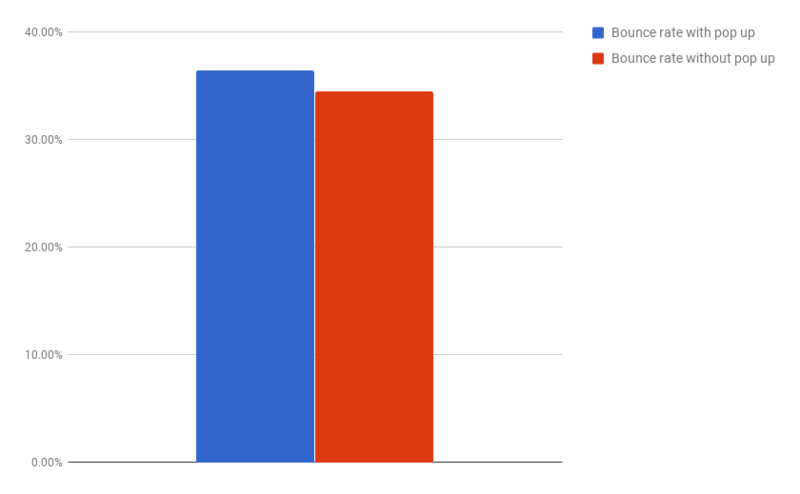 While this is obviously a small sample size, it is certainly enough to encourage me to continue using pop-ups as a way of driving engagement with my audience as it seems there is very low risk and very high rewards.